[A] Necessary documents to submit the patent application in Japan by the Paris route are as follows. [B] Necessary documents to enter the national phase in Japan by the PCT route are described as follows. In the case of the patent application prepared in other than Japanese, you need to submit Japanese translations of application documents. If Japanese translations of application documents aren't filed by the time limit, the patent application will be deemed to be withdrawn. [A] In the PCT route, it's necessary to submitted Japanese translations of application documents within thirty months after the priority date. However if the national document was submitted to Japan Patent Office within 30 months after the priority date, you can submit Japanese translation of the application documents within 30 months after the priority date or within 2 months after the date of filing of the national document, whichever is later. [B] If you use the application system of documents in foreign language by the Paris route, you can secure the filing date in Japan by submitting application documents in English to JPO. In that case, it's necessary to submit Japanese translations of the application documents within 14 months of the priority date. We recommend using the system because you can correct the incorrect translation within the scope of matters described in the description in English under the Japan Patent Act. And, Japan Patent Office doesn't permit the patent application in other foreign language than English. Therefore, if you hope to submit the patent application in Japan claiming the Paris convention priority based on the foreign application in other than English, it's necessary to prepare application documents in Japanese and to submit them to Japan Patent Office. You need to submit the request for examination with the request fee for examination to undergo the examination of the patent application. In the PCT route, you need to submit the request for examination within 3 years of the international filing date. 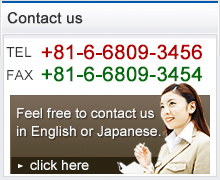 In the Paris route, you need to submit the request for examination within 3 years of the filing date in Japan. If the request for examination wasn't submitted by the due date, the patent application will be deemed to have been withdrawn. Then, there is no way to restore the patent application of which the request for examination was overdue. Furthermore, the period can't be extended. A third party can also request for examination, then JPO notify the applicant thereof. In the Paris route, the Official Gazette that states the content of the invention will be published after a lapse of 18 months from the priority date. In the PCT route, if the request for examination was submitted within 30 months of the priority date, the Official Gazette that states the content of the invention in Japanese will be published after the request of examination. In contrast, if the request for examination wasn't submitted within thirty-month period of the priority date, the content of the invention will be published in Japanese after the expiration of the period. When you receive the Notification of Reasons for Refusal, you need to submit the written response within 3 months. You can extend the response term by one month by applying for an extension of the response term within the original response term. You can extend the response term up to 3 times, so, you can extend the response term by up to 3 months. It's necessary to pay the annual fee for each year from the first to the third year as the patent fee within thirty-day period of the date of sending of the Notice of Allowance. You can extend the period by 30 days by submitting the application for the extension of the period to pay the patent fee. However, you need to submit the application for the extension by the original due date. Furthermore, you can pay the annual fee for the each year from the fourth year and subsequent years every year. 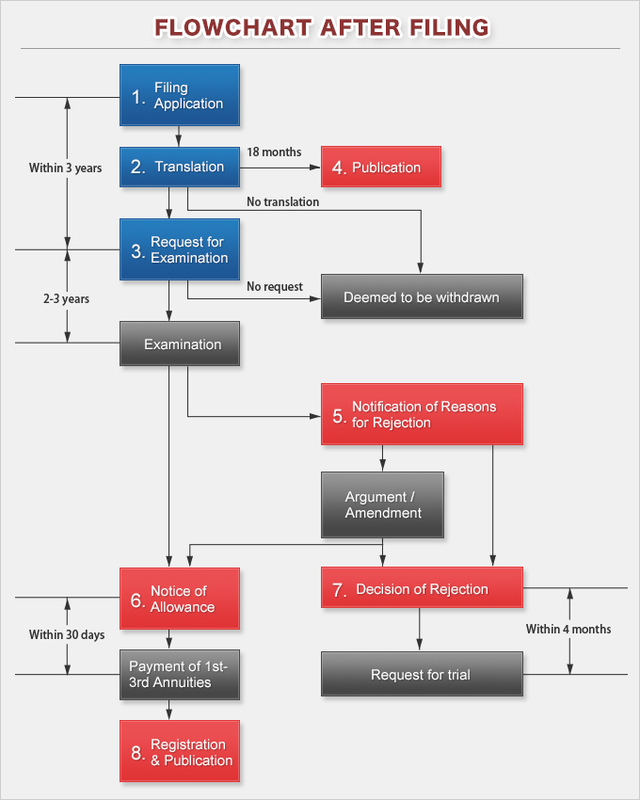 If you hope to demand for trial, you need to submit a written demand for trial within 4 months of the date of sending of the Decision of Rejection. In that case, you need to submit the amendment at the time of submitting the written demand for trial. The patent will be registered after payment of the patent fee, then the certificate of patent will be issued. And, the Patent Gazette which states the content of the patent will be published.